Studio + 1,2 & 3 bedroom units. Some Ocean Front and some "Near Beach" units. Fairly new large Family Oriented Time Share Resort Affiliated with RCI - has RCI "Gold Crown" designation. Every conceivable amenity including: "Lazy River" winding floating pool, Heated pool, 248 foot long water slide, hot tub, tennis courts, miniature golf, basketball courts, shuffle board, excercise room, free movie theater, restaurant and lounge. Ron Jon Cape Canaveral Condo Rentals Resort gets very good User Reviews. A lot to do without leaving the Vacation Time Share Resort for the many great nearby Attractions. Most amenities and many units are in a "near beach" complex on the same "deep" property with the Ocean front generally 2-bedroom units. Tram type shuttles run during the day between the beach and the main complex. 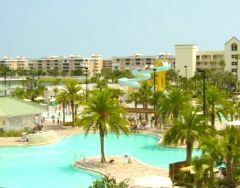 To Ron Jon Cape Caribe Resort Info and Pictures on RCI Web Site. See this Ron Jon Resort Information Page for Links to Rental Unit details, Amenities Info, and the Site layout of the already very popular Ron Jons Resort at Cape Canaveral, FL. Great Florida vacation beach rentals family destination. + See the Vacation Resort "Raves and Rants" or "Reviews" Other Site Viewers have shared below. Another Tip - the beach vegetation on the low beach "sand dune" in front of the Oceanfront Units is a bit tall so you want an unobstructed view on at least 2rd floor or above if possible - some units have a view of the entrance to Port Canaveral so can see Cruise Ships coming and going. Read candid user reviews and see 7 Cape Canaveral Resorts ranked by popularity with comparison pricing at this link: Compare prices and read what other travelers have to say at TripAdvisor for Cape Canaveral Hotels & Florida Vacation Beach Rentals. Oceanfront and non oceanfront listings are shown. Oceanfront time share resort that has the RCI "Resort of International Distinction" rating. One, two, and three bedroom units - ask if unit you are checking on faces ocean. All Units have Washer and Dryer. Resort has exercise room and sauna along with tennis, basketball, and volleyball courts. Cape Kennedy - 15 miles away; Sea World - 45 miles, Disney World 60 miles away. To Discovery Beach Resort Info and pictures on RCI site. Check Cocoa Beach Resort Rental User Reviews & Comparison Prices Link above for a comparison of reasonable Rental Rates for a resort with as many on site amenities. Good affordable Florida Vacation Beach Rentals possibility. Small beach front RCI time share resort. One and two bedroom units - ask about ocean view. Some units do not have microwave. Only on site amenities are outdoor pool and whirlpool. To Resort Info and pictures on RCI site. No rental rates are posted so have to call for rates and availability or check link below for other Cocoa Beach Condo rental options. Cocoa Beach Florida Hotels Cheap - Find discounts on Cheap Cocoa Beach FL Hotels or Discounted Oceanfront Cocoa Beach Resorts. Sometimes you can find a promotion package that includes Orlando, FL Attraction Tickets! Ocean front Resort rated "Gold Crown" by RCI. Two bedroom ocean front and ocean view units with Washer and Dryer in unit. (Ocean view units sit at angle to beach.) Also some 8th floor "upgraded Penthouse units." Share your own Florida Vacation Beach Rental, Exchange, or Owner User "Review" here. You Might be a Winner in the Contest! On site exercise room, basketball court, tennis courts, plus Jacuzzi overlooking the resort's fountain. Interactive childrens fountain, restaurant, pool side tiki bar, snack bar, and 50-seat theater on site. To Resort Info and pictures on RCI site. Can check link near top for details on rental rates for a resort with many on site amenities such as at Resort on Cocoa Beach. Good affordable Florida Cocoa beaches rental option. II affiliated ocean front time share resort. All 2 bedroom ocean front and ocean view units. Swimmng pool, whirlpool, and clubhouse on site. To Interval International ( II ) Web Site Resort Pictures and Info. Call or check link below for weekly Florida vacation beach rentals at Oceanique Resort and other Cocoa Beach Resorts. Worth considering for East Coast of Florida Vacation Beach Rentals. II affiliated time share resort. One and two bedroom ocean view units. Ask how close to beach unit you are considering is and whether it is oceanfront Vs "view." On site complimentary movies, pool, and gas grills at poolside. To Interval International ( II ) Web Site Resort Pictures and Info. Call or check link below for availability of weekly Florida vacation beach rentals at Seagull Beach Club Resort and other Cocoa Beach Resort Condos. Share your own Florida Vacation Beach Rental, Exchange, or Owner User Comments here. Oceanfront RCI Time Share Resort. 1, 2, and 3 bedroom units. Smaller Resort - "narrow" beach area. Different staff and rules than Las Olas - Satellite Beach above. All units have full kitchen and washer and dryer in the unit. All of the one bedroom units and some of 2-bedroom units face the pool Vs the ocean. Ask about 2-bedroom unit you may be considering if oceanfront view is important to you. Very limited availability on 3-bedroom units for Florida vacation beach rentals. Cocoa Beach Hotels Cheap - Find discounts on Cheap Cocoa Beach Florida Hotels or a Cheap Oceanfront Cocoa Beach Resort. Maybe you can find a Cocoa Beach Resort Timeshare Promotion Package that includes a couple of Orlando, FL Attraction Tickets! Orlando Timeshare Vacation Promotions - Time share Resort Sales Site using Cheap Orlando Timeshare Promotion Vacations as incentives. Includes some general Orlando Getaway Vacation Packages and Disney Vacation Packages. Our Site Viewers user experiences and "Reviews" that could help other visitors to this Florida Vacation Beach Rentals page make a decision as to which Oceanfront Florida Timeshare Resort to pick for their Affordable Vacation Rental or Exchange. "Rave or Rant" -- or just share -- a little about your personal experiences with any of the RCI or II Resorts Listed above on the easy fill in form below so others can benefit from your experiences. This Link goes to a Resort Condomonium International (RCI) Resort Directory selection page where you can do a quick look up of pictures and amenities of RCI Cocoa and Satellite Beach Timeshare Resorts which are on the Beach. Scroll down just under the map on the RCI Resort Directory page above, and type Cocoa Beach in the search box and click green "Search" button. You will get a list of possible RCI Cocoa Beach Timeshare Rental Resorts + some other "nearby" RCI Resorts with availability. Look for Resorts with the small square umbrella on beach Resort Amenity in green under the Stars Rating. Repeat steps for search for Satellite Beach to see Satellite Beach area resorts. Tip Notice that a link to the RCI Directory resort description and pictures is available, as well as the direct link to the Resort Web site so you can easily check on their availability and pricing of Ocean Front Florida Vacation Beach Rentals. Tip Notice that a link to the II Directory resort description and pictures is available, as well as the link to the Resort Web site (in small type near top) so you can easily check on their availability and pricing of Oceanfront Florida Vacation Beach Rentals. This resort is actually on same property with "Ocean Landings - Carribean and Dream Buildings" which are both Ocean Front Buildings and are also discussed above. The non beach front are a good option to consider for affordable ("cheap") Florida vacation beach rentals. Favorite area Florida Vacation Beach Rentals + area attractions and places of interest you found interesting or memorable. Comments on great Florida vacation Beach area Timeshare Resort weeks (preferrably beach front) you may own, have exchanged to, or any favorite Cocoa / Satellite Beach rentals - especially Affordable Time Share Resort Florida Vacation Beach Rentals. Send your Favorites or Florida Vacation Beach Rentals Top Picks to us on our Comments Page Thanks! Florida / Virginia Beach Time Shares Guide (+ All Time Shares) - WHY Timeshares? Do they REALLY save you Vacation Dollars on Virginia and Florida Vacation Beach Rentals? 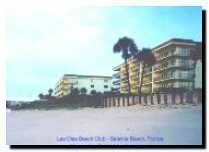 Las Olas Beach Club Resort - Satellite Beach - Florida Beach Front Rentals Page - Rental and Timeshare Exchanging Review and Tips for Florida vacation beach rentals. Waterfront Cocoa Beach FL Restaurant Top Picks - "Reviews, Pictures & Tips.